Apologies for being a bit absent from the blog but life has been a tad hectic, I now have a blog, a website, and a facebook page to maintain and update on a regular basis plus have also been creating pages on several holiday booking websites to get the ball rolling with bookings. This time last year I went through a period where I really wondered if it was possible for me to see my ideas come to fruition. It was a big project and scary attempting on my own...I had never done anything like this before. 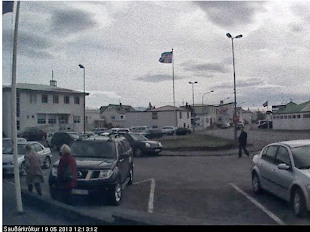 At one stage when doubt was knocking loudly I even toyed with the idea of just leasing the middle floor to others for businesses...but it just did not feel right and so that spurred me on to stick with my initial gut feeling I had when I first walked through Gamla Pósthúsið. And so a year on the apartments and retail/gallery space are now finished...just wireless internet to be installed in the building ....then it is all done. I have been madly moving everything in to the apartments, cleaning, washing all the new stuff before use, hanging block out blinds etc. I am not that fast anymore, once I could have worked non stop all day until late at night but I find my body just can't do that anymore...so I have to pace myself...can be particularly frustrating! Apartment one is now completely set up and my first guests arrive tomorrow, non paying but my good friend Judith visiting from Australia with her nephew George will be the first holidayers in the apartment. I worked with Judith for 6 great years at Edith Cowan University, the other member of our Art Education team Gill, visited me last year. It will be lovely to take a few days break from everything and do a bit of socialising with them...really looking forward to that. Apartment 1 is now completely set up, if you have been on to my facebook site you will have seen these photos but I know many of you aren't on FB so here they are. There was a bit of trouble with the floors but the builder happily re did them and they now look great. I have been very impressed with the quality and thoroughness of the workmanship here, I have no reason to complain about anything...everyone has been great to work with and I highly recommend Skúli and his team at Trésmiðjan Borg they have done a fantastic job! This kitchen is better than the one I have upstairs. The young tiler did a great job. The empty space in the bathroom will be filled eventually with a washer/dryer. I will post photos of apartment 2 sometime next week, although it will look much the same just a slightly different layout and a tad smaller. Once I have the apartments all sorted I will perhaps have a little more brain power to work on the retail/gallery space and try to visualise how that will unfold. Congratulations Vicki, it looks amazing. Classy and inviting. Hope you get lots of bookings. Thanks Unnur, bookings are starting to roll in. It all looks so nice, Vicki, you've done an amazing job! Can't wait to see it, and you, of course! P.S. If there's no one in there, you could totally use the downstairs kitchen instead of yours? Well Vicki the apartment looks fantastic, congratulations! Really looking forward to seeing them at Xmas. I was saying to Steve that I thought there would be enough room in the bathroom for a washer and dryer. So you answered my question. Xmas will be here before we know it. You've made a lot of progress while I've been away Vicki and the apartment looks fantastic. What a wonderful job you've done and what a temptation in such an exotic location! Maybe your next trip overseas Helen could swing this way. Thanks sweetheart, love you and miss you! Nicely done! It's been a long time coming. Yes it has been a while, especially when you have followed from the very beginning birth of the idea to now. Thanks Jon for your support. Wow I just love the stunnning whites and woods - and the floors, they look amazing! You really have a flair for decorating Vicki. Most of all tho you have - for me - this inspiring persistence to achieve :-) Congratulations! Thanks Anita for such lovely words...I really appreciate them. Perhaps you will consider putting Iceland on your list of retirement travels...I would love to see you here. It looks fantastic, Vicki, what an achievement!